Principal cellist Carter Brey played the Don Quixote solo part, with principal violist Cynthia Phelps as Sancho Panza, playing from her first chair position. She stood out in tone and execution from the rest of her section. Brey was excellent, for a long time the only orchestral voice moving forward with a clear sense of direction and purpose. The tenderness he brought out, and his cantabile phrasing, were touching and satisfying. Brey is a literal musician. He doesn’t milk a long-held note for a bloom where no bloom is called for. When he distorts rhythms with a rubato or an extra push, he does so with the utmost discretion. More may be called for to make a point in a large concert hall but up close, the sort of restraint that Brey offered spoke volumes. Carter Brey, the Philharmonic’s stellar principal cellist, was an excellent soloist in Schumann’s Cello Concerto. This work mostly holds its bravura moments in abeyance until the finale, and Mr. Brey rose to them admirably. 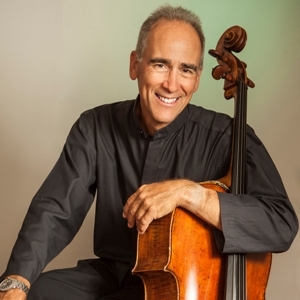 Brey demonstrated why he has a reputation for deep and affecting artistry in Robert Schumann’s “Cello Concerto in A Minor, Op. 129,” finding moments of genius, both melancholy and mercurial, in the score. During the sustained ovation, Brey extended warm congratulations to NBSO principal cello Leo Eguchi, who duetted with him so ably in the second movement. Brey and Nakamatsu ended the first half with a stunning performance of the E minor cello sonata of Brahms. This is an introspective and melancholy piece of considerable beauty. Both cellist and pianist have obviously given the sonata a lot of thought, and probably played it with a great variety of other artists. That aside, the two appeared to have the same concept about the sonata and thus delivered an interpretively unified reading. Many in the audience let the music carry them along and there was a collective sigh at the end before the applause started. A difficult but rewarding new piece of music received its world premiere Sunday night at the Kravis Center, and its presenters made sure that first sendoff was an exemplary one. Cellist Carter Brey and pianist Christopher O’Riley debuted Justin Dello Joio’s Due per Due (Two for Two) before a midsized but noisy crowd at Dreyfoos Hall that nonetheless gave the work appreciative applause. "The quality of his intonation, size and beauty of his tone, dazzle of his virtuosity, and confidence of his manner were immediately apparent." "In Washington last night, Mstislave Rostropovich leaped to his feet and started a standing ovation...Mr. Brey's technique is nearly flawless, he can turn up the emotional thermometer to the boiling point when he chooses, and he has the sense of showmanship without which his spectacular musical ability might remain known only to connoisseurs." "The beauty of his tone and his way with a long lyric phrase are both spectacular"